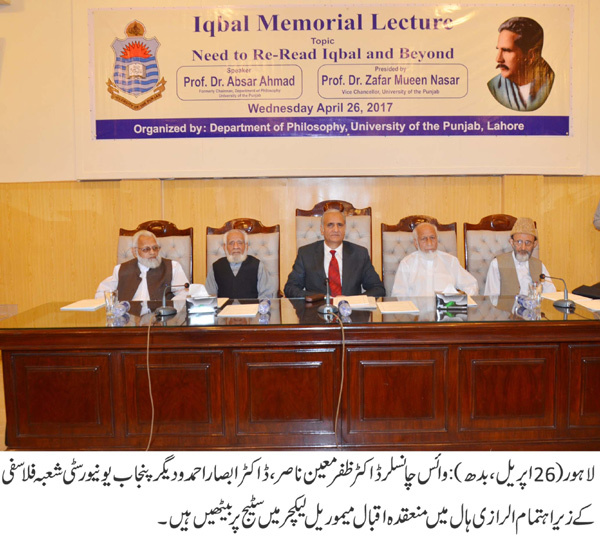 LAHORE: (Wednesday, April 26, 2017): Punjab University Vice Chancellor Prof Dr Zafar Mueen Nasir has said that we must have faith in ourselves in the light of teachings of Allama Iqbal. 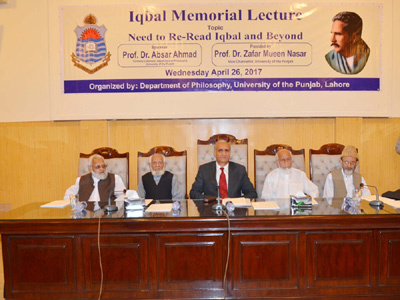 He was addressing Iqbal Memorial Lecture on “Need to re-read Iqbal and beyond” at Al-Raazi Hall organized by PU’s Department of Philosophy. On this occasion Chairperson Department of Philosophy Dr Shagufta Bukhari, former Chairman Prof Dr Abasar Ahmad, senior faculty members and a large number of students were present. Addressing the ceremony, the PU VC said that unfortunately, we were not committed to our goals as our youth had neither recognized nor fixed their responsibilities. He said that Allama Iqbal had tried to reconstruct Muslim religious thought with due regard to the philosophical traditions of Islam and developments in the various domains of human knowledge. He said that Iqbal hoped that the scholars of the time would move forward with the knowledge and exposure of their age to resolve the issues of their time. He congratulated Dr Absar for his thought-provoking and scholarly lecture. In his keynote address, Dr Absar said that Allama Iqbal needed to be read anew in the light of more recent development in human thought. He said that indeed, of the vitality and vigour of Islam, there could be no proof wanting in our own days. He said that today, secular modernity was incapable of sapping its spiritual energy and shaking its cultural foundations. He said that in an age bent upon civilizational suicide, Islam offers a venue of hope, sanity and universal bliss. Dr Shagufta Bukhari said that every person of any society could seek guidance from the teachings of Allama Iqbal maintaining national identity.